Building a vertical garden is the best way to add height to your landscape. But there are lots of things to consider when designing your own. 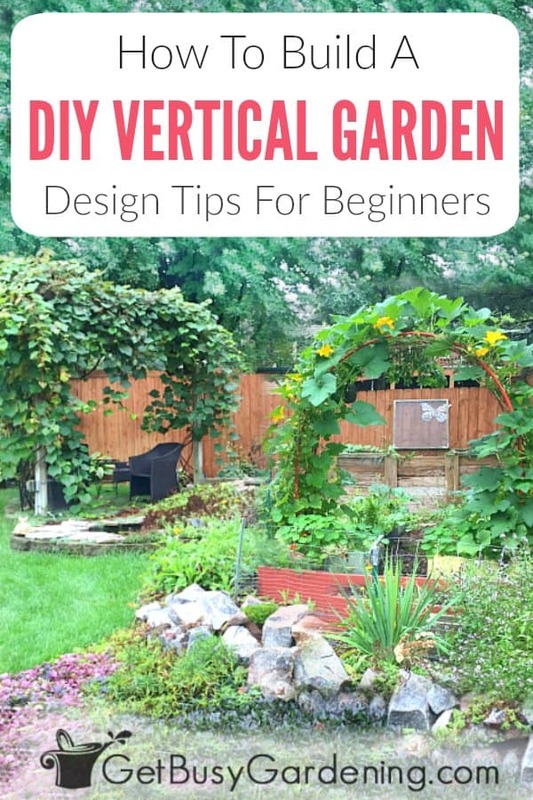 In this post, I’ll show you how to make a vertical garden, and give you tons of easy DIY vertical garden design tips to get you started. If you want to make your own vertical garden, then you’re in the right place! Vertical gardening has become super popular over the past few years, and creating a vertical garden is so much fun. My favorite thing about growing vertically is that I can use my creativity to grow plants in fun and unique ways. There aren’t any hard-and-fast rules for building a vertical garden, which means our options are basically unlimited. However, there are a few things to keep in mind before you begin. Below I will show you how to create a vertical garden, and give you tons of simple DIY vertical garden design tips to get you started. To avoid any epic gardening faux pas, it’s a good idea to come up with a plan before you start building a vertical garden. You don’t want to haphazardly plop in a bunch of growing structures, so be sure to do a bit of planning first. Vertical gardens should become gorgeous additions to the landscape rather than unintended eye-sores. 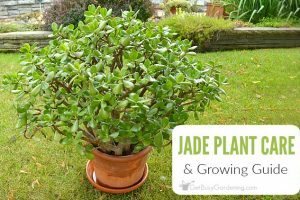 You also want to ensure that your plants will grow their best, are easy to harvest and maintain, and that the structures will mesh perfectly with the size of the plants that you want to grow. Most importantly, don’t overwhelm yourself. If you’re new to gardening, then start small. Add one or two structures to your garden first. Once you get the hang of it, then you can build more vertical gardens. 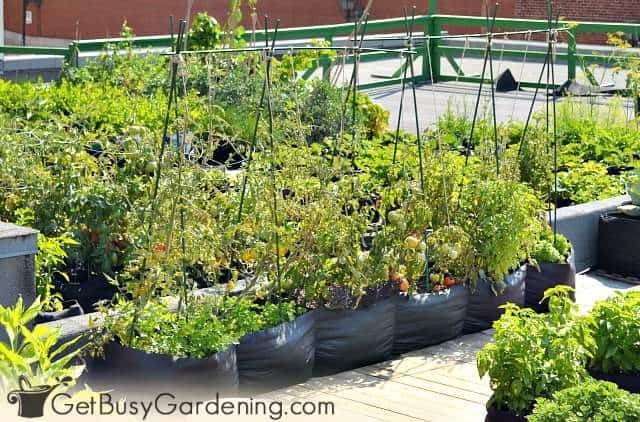 When you start thinking about all the different types vertical gardening systems and supports you could use, it’s easy to get caught up in the excitement and forget to think practically. But it’s important to choose the right type of structure for each of the plants you want to grow, and for the size and style of your garden. Below are some essential things to consider as you design your DIY vertical garden. 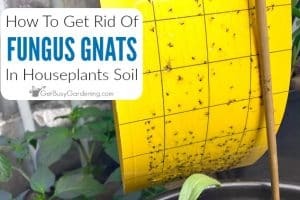 Before you get excited and hastily start building vertical gardens all over the place, first think about what types of plants you want to grow. Will you plant flowers or vegetables? Do you want to grow climbing plants on trellises, or would smaller plants in a vertical container garden work better in your space? For example, you might think an arch would look incredible standing at the entrance of your garden. But if you never grow any vining plants to cover it, it may end up looking silly just sitting there empty. Likewise, a vertical living wall may not be very useful if you already have a large garden plot with plenty of space for growing anything you want. 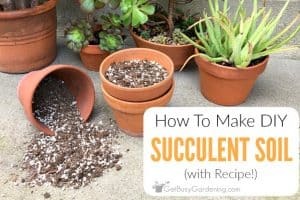 So the first step is to make a list of the types of plants you want to grow. Then you can start to think about the vertical structures that would work the best for those specific plants. Learn more about how to choose the best vertical garden plants here. As you plan your DIY vertical garden, think about where you want to build it so that it won’t cause any problems. For example, tall structures placed at the south end of a garden plot can end up shading the rest of the garden. Placement is an important consideration for hanging gardens too. A north facing fence or wall will shade the vertical wall pockets or living picture frames hanging on it. So be sure to consider the sun exposure of the area where you want to build a vertical garden. 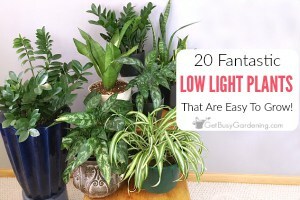 That way you’ll know that there will be adequate sunlight for your plants, and that you don’t unintentionally create shade in other parts of your garden. Another thing to consider as you design a DIY vertical garden is the style of your existing garden space or landscaping. Vertical supports are not only functional, they are decorative elements in the garden as well. If your garden style is informal and casual, then stately structures like arbors or obelisks could be overbearing. On the flip side, a rustic teepee made out of twigs, or a handmade bamboo trellis may look awkward in a formal garden setting. So be sure to design vertical gardens that mesh with the style of your existing space. That way they fit in perfectly, and add to the beauty of your garden, rather than looking clumsy and out of place. Before building a vertical garden, it’s crucial to think about scale and proportion. You want to ensure that the size of the structure you plan to use is proportionate to the size of the plant. So make sure you know how large a plant will grow before you choose a vertical structure for it. For example, growing ten foot long climbing vines on a four foot tall trellis will be overpowering. Likewise, putting large plants in small vertical wall pockets could end up being disastrous once the plants reach their full size. On the other hand, if you want to plant small climbing vines that only grow to be a few feet long, then a large garden arch or arbor is going to be superfluous. In addition to the proportion of the support to the size of the plants you want to grow, think about the scale of your DIY vertical garden in the existing space. 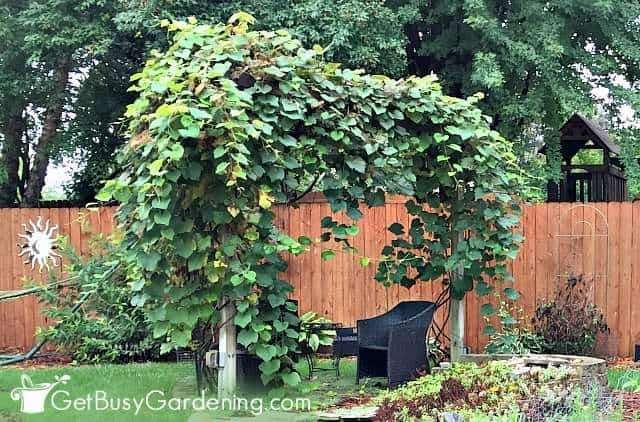 Plopping something tall like a pergola in the middle of a tiny garden will likely overwhelm the space. While hanging a small living picture frame or two in the middle of a huge empty wall would look equally disproportionate. When planning your DIY vertical garden, think about how the structures you choose will fit into your long-term plans. Large supports like an arbor or a pergola will become permanent fixtures in the landscape. While smaller things like a lean-to or an a-frame can easily be relocated after each gardening season. This is especially important for crop rotation in the vegetable garden. When you can move your vertical supports around, it makes crop rotation much easier. The maximum height a vine will grow is different depending on the type of plant. Some vines are short, only growing a few feet tall. Other vines can grow tall enough to reach the tops of trees. Or you can grow climbing plants anywhere in between those two extremes. So make sure to choose a support that’s tall enough so the vine will have plenty of room to grow. 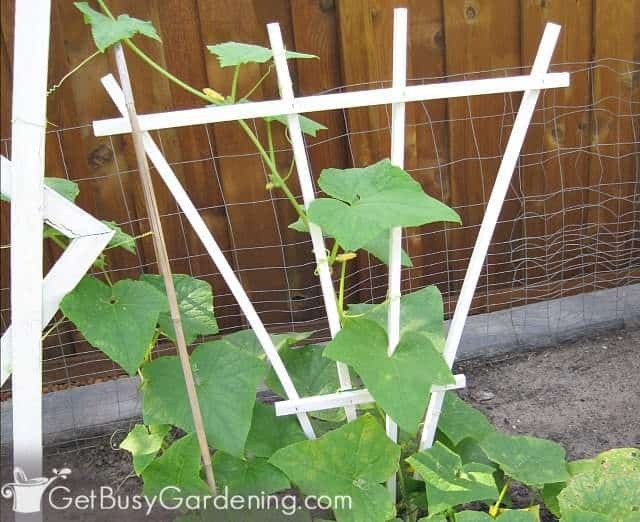 A small wire cage or a fan trellis would be sufficient for growing short climbing plants, but longer vines will need a much taller support. One of the most crucial things to consider when designing your DIY vertical garden is strength and weight. Once large climbing plants reach maturity, they can become very heavy. This is especially true of vegetables that are full of produce. You don’t want a support to collapse under the weight of heavy vining plants. So be sure to choose a structure that is sturdy enough to hold the full weight of the mature plant. Weight is also an important thing to think about for hanging gardens. The soil in these containers will become very heavy once it’s wet. So consider how heavy your containers will become once they are planted and saturated with water. Then ensure that the spot where you plan to hang them, especially on a wall or fence, is strong enough to support all of that extra weight. 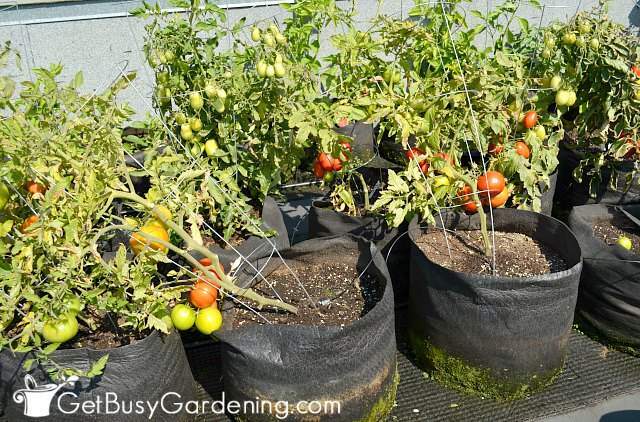 Harvesting is usually easier in a vertical vegetable garden, but choosing the wrong type of support can actually make it more challenging. Some types of structures, like narrow obelisks or complex string trellises, can make harvesting difficult. These compact structures keep the vines in a tight cluster, which makes it harder to find and reach the fruit growing in the center of the support. 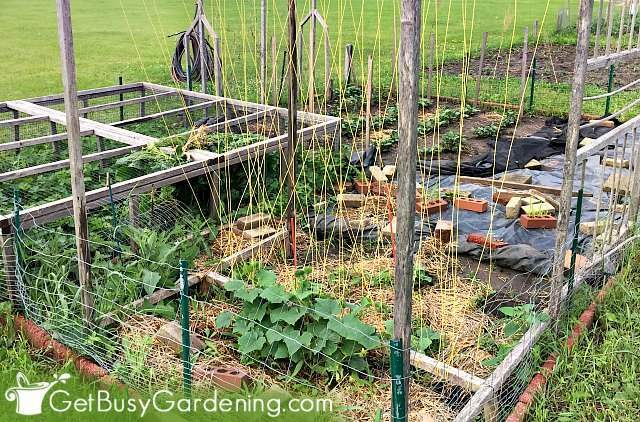 Tall structures can also make it difficult to harvest your vegetables. Getting out a ladder once or twice to harvest crops like grapes or hops isn’t a big deal. 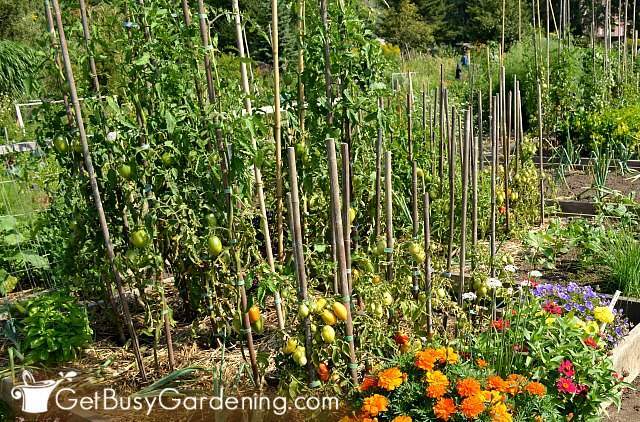 But lugging the ladder out to the garden on a daily basis is not very practical for most gardeners. Designing a DIY vertical garden isn’t hard, and it’s fun to come up with a plan. But there are a few things to consider before building a vertical garden. Whatever you decided to create, just remember to start small so you don’t get overwhelmed. If you’re interested in learning how to build a vertical vegetable garden, then my brand new Vertical Vegetables book is perfect for you! 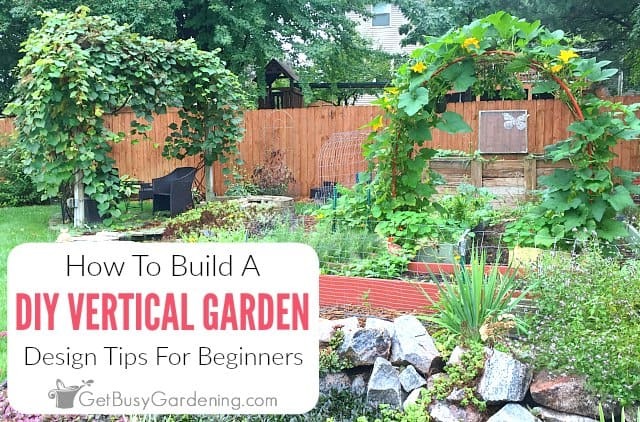 It will teach you how to make a vertical vegetable garden, plus there are almost two dozen step-by-step projects you can build for your own garden. Share your DIY vertical garden design tips in the comments section below!